The Western Specialty Contractors Facades division was created in 2012 to service our customers with specialty facades needs, including rainscreen system installation and recladding. A building’s envelope, or enclosure is the physical separator between the exterior environment and the interior space of the building. It helps to maintain climate/rain control as well as provide the building with structural support. 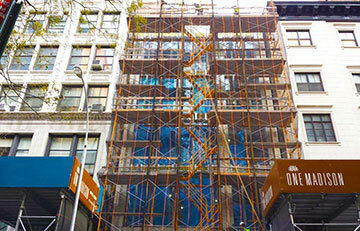 It is vital that all changes/repairs made to a building’s envelope are made by skilled building envelope companies. A curtain wall system is an outer covering of a building in which the outer walls are non-structural, but merely keep out the weather. As the curtain wall is non-structural it can be made of a lightweight material reducing construction costs. When glass is used as the curtain wall, a great advantage is that natural light can penetrate deeper within the building. 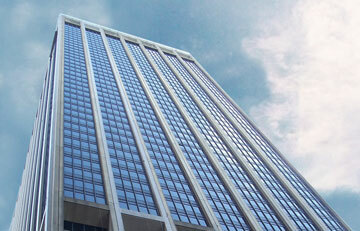 The curtain wall facade does not carry any dead load weight from the building other than its own dead load weight. The wall transfers horizontal wind loads that are incident upon it to the main building structure through connections at floors or columns of the building. A curtain wall is designed to resist air and water infiltration, sway induced by wind and seismic forces acting on the building, and its own dead load weight forces. A facade is the exterior of a building, and while it may not support the building structurally, it is imperative to keep the structure safe from damage by the elements. 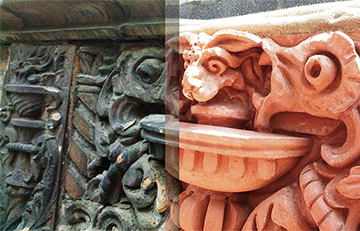 Western Facades has years of experience working with all types of building facade restoration including masonry restoration. Rainscreen system cladding is the attachment of an outer skin of rear-ventilated cladding to a new or existing building. The system is a form of double-wall construction that uses an outer layer to keep out the rain and an inner layer to provide thermal insulation, prevent excessive air leakage and carry wind loading. The outer layer breathes like a skin while the inner layer reduces energy losses. The structural frame of the building is kept absolutely dry, as water never reaches it or the thermal insulation. Evaporation and drainage in the cavity removes water that penetrates between panel joints. Water droplets are not driven through the panel joints or openings because the rainscreen system principle means that wind pressure acting on the outer face of the panel is equalized in the cavity. Therefore, there is no significant pressure differential to drive the rain through joints. During extreme weather, a minimal amount of water may penetrate the outer cladding. This, however, will run as droplets down the back of the cladding sheets and be dissipated through evaporation and drainage. 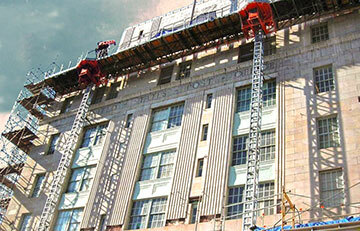 Western Facade specializes in all types of facade restoration including masonry recladding. After a building has been repaired and waterproofed, improvements will be made to the exterior face including the re-application of brick or masonry cladding. Western can also preserve and reclad historical buildings matching the look of the original materials. 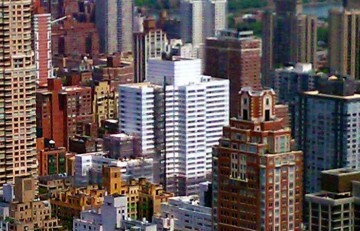 Western Specialty Contractors Facades Division is conversant with all governmental and regulatory codes including the New York City Ordinance. Additional city facade ordinances include: Boston, Chicago, Columbus, Detroit, Milwaukee, New York, Philadelphia, Pittsburgh and St. Louis.